I have been asked often for an archive, a place for Fish Reports, and now that I’m going forward with tutorial videos along with diagrammed pictures…it made sense for “FishDuck.com” to be a reality. Like any new project — it grows much bigger as we explore all that we can do, thus it will be much more than just an archive of Fish Reports. What is the new site about? The Fish Football Tutorials videos are meant to be timeless, as basic explanations of the Oregon Offense. (And later our defense) The Fish Reports will continue to be timely observations/analysis of scrimmages and games as in the past. The FishWrap will be occasional thoughts and ponderings through the week (like a blog) and The FishBowl will be a football message board. We will be ruthless in sorting out the wackos and those who insult, and are behaving unlike a gentleman. They can go to other sites for that, as we want great football discussion-highbrow stuff and we will prune out the culls in a hurry. I encourage everyone to continue with the other sites as usual. I will not be doing player/coaches interviews or recruiting information as other sites do. We as Duck fans need the valuable services and information they provide and even I will keep my own three subscriptions with all of them to learn a lot of new recruiting information and reports that come on a daily basis. I am grateful for all they do, and I wish to complement what they do by offering something they don’t; in-depth analysis that people can SEE as well as read, along with a safe environment for heavy-duty football discussion without the inane nonsense that occurs on most boards. I fully expect that we will have our own high-quality market segment…that will attract those who like to ponder stuff without being ridiculed or chided. 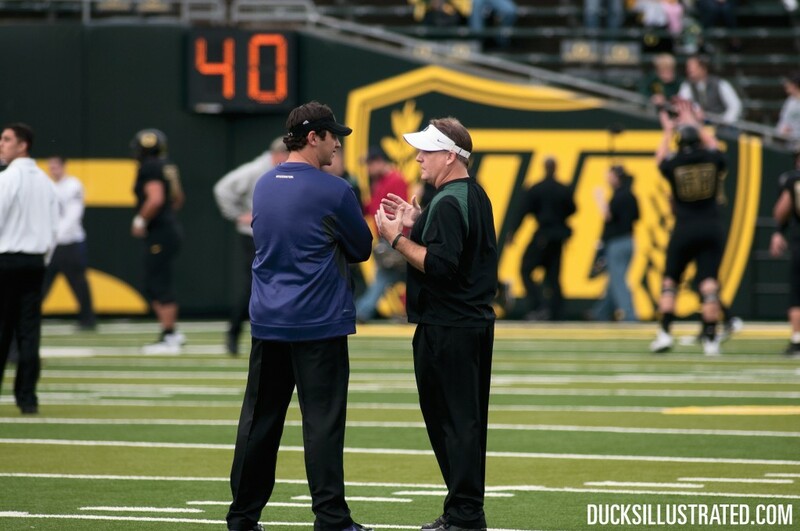 There will not be any cost…and since I don’t know it all — I am open to corrections and additions to what I am writing to benefit the greater body of Oregon fans who want to learn. We will not be using banner ads, pop-ups, and company’s ads down the side of the page. Typically the other football sites get approximately an eighth of a cent from the advertisers every time someone comes on the page that contains the usual banner ads. It is not a big money-maker, and while they wish to sort out the extreme rogue posters, they will allow most to remain since they need the hits on the pages. When the rude poster does write — it will frequently bring a response from many people, hence a thread of nonsensical back-and-forth. Thus over time these other boards get PAID for the uncouth ruining it for everyone else. There are a great number of knowledgeable, intelligent posters who refuse to post again after having someone jump down their throat because they disagreed on a point of discussion. The only ads on FishDuck.com will be for my investment services thus the overall plan begins to make more sense as I don’t want the wackos because they are not serious about football discussion. Websites get paid by advertisers for the number of hits on a page while their ads are present. I do not need the hits, and want fewer of the high quality people that are a matchup for a Gentlemen’s board. Hence the opposite effect could result; by pruning all the culls we could attract the higher quality posters from other places, or many who currently do not post might now be more inclined to do so with a “safe” place to write. We have no compunction about being callous at eliminating those who pick at others, insult or name-call. We will not tolerate even the slightest passive-aggressive nonsense, or any antagonistically offered “questions” by opposing or our own rude fans. Everyone will be welcome, especially the classy fans of other teams to trade info about each other’s teams to enhance the enjoyment of the games for all. But everyone has to be nice, with no insults, names, or any snide stuff. There are all the other sites for that where they can go to get that…just not on this one. We are Gentlemen here, and we will defend everyone immediately from even the slightest attack. We want your thoughts in The FishBowl, and we WILL make it a more refined place to trade information with fans of all teams. There are wonderful people cheering for all teams out there and we want them to stop by here, while all of us learn from each other and make new friends. If they can be Gentlemen, then so can we! It could emerge with quite a following when intelligent, rational people from all teams realize there is a “safe” place to go to talk football and Xs and Os. We would rather have 100 posters who are good and decent, instead of 10,000 posters who engage in nonsense. We don’t need the hits…so we won’t tolerate the nonsense. In fact it will be fun to weed them out! As it comes together…there will be no other site like it. With the way I write my Fish Reports and now the tutorials…the atmosphere will be different as one of learning and sharing notes. If you disagree or have information to add, then do give me link to see where you are referring as I do in my reports. I HAVE changed reports in the past and will continue to as I learn from all of you. I will encourage classy fans of other teams to come learn about Oregon and share some Xs and Os about their team. Anyone who is civil, smart, pleasant, etc (you get the idea) is welcome. I originally did not plan to have a message board…but I see the need out there for precisely what I just described…so why not do it? We will be the Rolls-Royce of Football boards — not in features, not in costs, but in the membership. Now — let’s learn some more FOOTBALL!